Material: Brushed Nickel. For use with LTHR Handrail. Superb handrail end caps to complete your handrail installation. 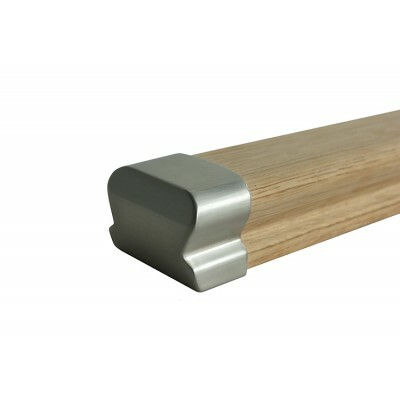 Manufactured from quality materials and finished in a highly attractive brushed nickel finish to compliment your home decor, these SOLUTION handrail end caps suit our 62mm (w) x 43mm (h) low profile handrails. When you install a handrail against a wall, these handrail end caps will add a professional and elegant touch while at the same time, make DIY tasks easier by hiding the cut end - ideal if you struggle to cut straight! These caps will hide any unsightly rail ends. Two 5mm diameter countersunk fixing holes underneath allow for easy fixing and removal for redecorating. Supplied as a single unit. Fixings included. Fixing Holes: 2 x 4mm dia.